We Shri Vinayak Packaging Machines Pvt. Ltd. are known as the best Manufacturer, Exporter of Hand Impulse Sealer. This sealing machine is used to seal the product's packaging and thermoplastic material with the help of heat application. 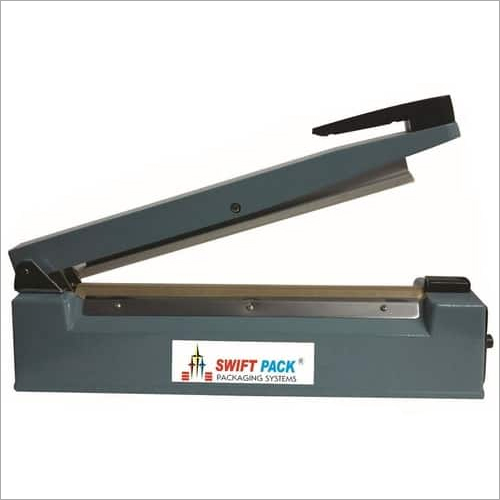 We are reckoned in the market as a quality oriented firm only quality approved Hand Impulse Sealer Machine to the clients. It is designed from the high grade material such as stainless steel, carbon allows, and others, as per the global quality standards. Our fully fledged quality control lab enables us to ensure high quality level of Impulse Sealer Machine. Our experienced team of quality controllers tests the sealing machinery on varied factors to ensure to provide the clients with an error free range. These products are strictly tested for durability, endurance level, sturdiness, resistant to heat and pressure, rust proof.